SAN FRANCISCO, CA--(Marketwired - Sep 17, 2014) - With the San Francisco Giants playoff-hungry for the postseason, now more than ever, Giants fans are laser focused on baseball news and timely updates. To satisfy this demand, MobSoc Media today announced the first-ever launch of SF Giants Fancast, the sports newsroom of the future and digital community news site for Giants Fans that collects and sorts the latest up-to-the-minute news about the Giants from around the web, where they can quickly find the most engaging content. The site also offers the latest news for each player and personalization features where fans can follow updates for their favorite players or any topic they care about. 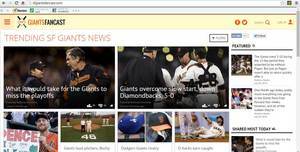 SF Giants Fancast delivers a one-stop hub of news and information about the Giants from a variety of news and information sources. Each piece of content is ranked via proprietary Social Rank® crowdsourcing technology so that fans can find the most popular, relevant and trending Giants stories. This makes it easy for fans to find the most engaging articles based on reader engagement across the internet, major social media platforms and video sites. The website has a fully responsive design and works great on smartphones, tablets and desktops. 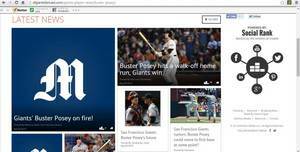 "Every Giants fan across the country is urgently following the news to cheer this team on to the postseason, and we wanted to give them a better resource to find the most important and engaging Giants content each day," said Steve Wick, Founder and President of MobSoc Media. "Our SF Giants Fancast site makes it easier than ever for Giants fans to stay up-to-date with the latest and top performing stories about the Giants and their favorite Giants players." MobSoc Media's proprietary Social Rank® technology curates and ranks content for specific niche audiences (such as fans of particular sports teams) by using a complex analysis of crowdsourced recommendations for articles based on social media shares on Facebook, Twitter and other channels. MobSoc Media provides 42 consumer interest based websites across Entertainment, Lifestyle, Business and Sports publishing groups. Other MobSoc Media sports websites include NFLNewscast, Nascar Newscast, and MMA Newscast. For a complete guide to all MobSoc Media publishing groups including the Sports related properties click here. Founded in late 2012, MobSoc Media, based in San Francisco, is the only interest-based publishing network optimized for the mobile and social world and closed $5 million in Series A funding in late 2013. One of its premier digital properties, Celeb Bistro, has amassed 4.2 million Facebook fans, ranking in the top Celebrity News sites based on Facebook fan following. For brand marketers and advertisers, MobSoc Media assists with content marketing/native advertising campaigns and provides precise targeting of relevant audiences in the mobile and social sphere. As a result, MobSoc Media delivers some of the highest content engagement rates in the industry -- up to 7 times higher than the category average. For more information, please visit mobsocmedia.com.